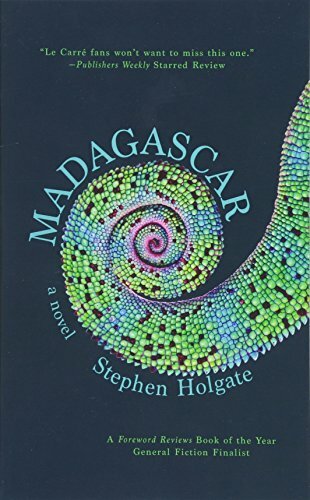 Stephen Holgate has written a fascinating and well-constructed thriller set in Madagascar. His time there as a diplomat in the US Foreign Service clearly not only informed him on the island, but also saw him develop an understanding of the people that comes through strongly in the novel. That’s not easy because the Malagasy have a quite different culture from the peoples of the rest of southern Africa, and it’s hard for outsiders to comprehend. This is summed up during a dinner discussion in the book when a Malagasy professor tells us: “It is said of many places that ‘anything can happen here.’ In Madagascar we must take that a step further. Not only can truly anything happen here, it must. We must stipulate that here, in our beloved island-world, the implausible is not only possible, it is mandatory.” Holgate not only makes the reader believe this, but also builds it into a page-turner with a powerful sense of place. Robert Knott is a diplomat at the US embassy in the capitol, Antananarivo. He has spent his career abroad, and has finally washed up in Madagascar. Having traded a drinking problem for a gambling one, he’s hardly the stereotype of a successful diplomat. He owes Maurice Picard, a Frenchman with a shady past and the owner of the Zebu Room casino, a substantial amount, and Picard blackmails him to launder local money for foreign currency through the US embassy. This makes Robert’s position there even more shaky. The novel is written in first person, and Robert has a fluent and consistent voice with the right amount of humor. Despite his flaws (or perhaps because of them), he’s an attractive character. One of Robert’s less pleasant tasks is visiting an American, Walt Sackett, essentially being held for ransom. The elderly man, who came to Madagascar to farm cattle, is kept in a squalid prison. His cell mate, Speedy, is an expert thief who is released every night to make money for the guards by stealing. Whether Speedy’s nightly activities are Holgate’s invention or based on fact, the story is quite plausible in the Madagascar context, and in an entertaining twist, Speedy falls for one of Robert’s straight-laced female colleagues. Walt has an attractive young Malagasy girlfriend Nirina from Tamatave, whom Robert at first dismisses as a gold digger. Yet she is willing to do anything to help Walt, and in spite of his best efforts, Robert finds himself sucked into their problems. When he visits Tamatave to investigate rumors of unrest there, he falls foul of the local police chief, Captain Andriamana, who runs the province as his personal domain. From there the action ramps up to a climax with Picard and Andriamana after Robert in a car chase like no other. The local culture is central to the story. The Malagasy call Madagascar the Island of Ghosts, and most believe that “their ancestors are always present, just over their shoulders, their spirits squeezing into every corner, tapping at the windows, haunting the doorways, until there is not enough room for the living.” Robert understands this, but, of course, doesn’t believe in it. As he says himself: He prefers to keep the island at a distance. The island has other ideas.